Let's face it, in the world of complex, heterogeneous systems that we spend so much of our time in, logging and tracing are an absolute necessity. For example , the ability to analyze a SIP dialog, step by step, can sometimes be the only way to debug a particular problem. If you have followed the tracing evolution of the Microsoft UC stack from the "flat file" logging in LCS ( AKA The Stone age), to the OCS logger days (AKA The Bronze age), now to the Modern era of Centralized Logging Service (CLS logging) we currently enjoy ( OK, maybe "enjoy" is too strong a word! ), it is obvious that there is a premium placed on collecting and analyzing logs these days. Session Border Controllers (SBC) are the "firewalls" of any modern VoIP implementation , providing a termination point for both the carrier and internal deployments, while serving to protect each from the other. This is also a place to match, modify, or otherwise manipulate signaling and/or media in nearly unlimited ways. I currently have the distinct pleasure of being one of those responsible for the "care and feeding" of a very busy S4B deployment that routes its traffic to the PSTN via AudioCodes Mediant Session Border Controllers. As with S4B, the concept of "always on" logging at this crucial point in the network is practically a necessity. As mentioned in the opening paragraph, in order to keep up with those evolving debugging requirements, AudioCodes' troubleshooting tools have thankfully received their share of attention with respect to features and ease of use. While there are times when tools that can be spun up quickly like Power Syslog Server are absolutely a requirement for some situations ( Thank You, James for another great tool! ), my requirements currently are closer to the "AlwaysOn" methodology. I don't know when I may have to go back and look at a call flow, and I don't always have the ability to ask the end user to try and recreate a reported problem. Enter the newly updated "Syslog Viewer" from AudioCodes R&D. My initial attempts at setting this tool to run as a windows service were not met with much success. However, thanks to some able assistance from @mikerps and the AudioCodes R&D team, they were able to update the tool to add a command line argument ( more on that in a moment) that allows you to specify a startup configuration. This way, I am able to run it as a service, collecting my logs in the background, allowing me to search them when needed. Here are the components I used to accomplish this. First, you need to grab a copy of the latest syslog viewer ( You'll have to login to AudioCodes' site) . Next we need to create the text file that we will use when launching as a service. IMPORTANT!! , DO NOT launch the program from the start menu at this time. Instead, we will have the program create the file for us by specifying the filename and path from the command line, as shown below. If you are are going to be using this as an "AlwayOn" logging tool ( which is WHY you are reading this , right ? ), be sure to set your log file size and number of files before rotation occurs. If you are pointing more than one device to the logger, be sure to check "Create separate files for each device", as this will enhance your ability to locate logs in a busy environment. File -> Write Log As..
and set your log path and file name. As mentioned above, if you have multiple devices, the IP address of the device will be appended to this name. For reference, you can confirm the target folder by looking at the title of the Syslog Viewer window. Now, close the viewer to write your config file. Then navigate to the folder where you specified your config file when you launched the viewer. If all went well , you will have an INI file with the settings you just specified. When you view this INI file , notice you will see the "WriteLog = true" and "RecentWriteFile=" as the file and path where logs will be stored. Now, download and extract NSSM. (You can also deploy it via chocolatey using "choco install NSSM") There is no real install needed. Simply extract the file. NSSM can be configured via CLI or GUI. 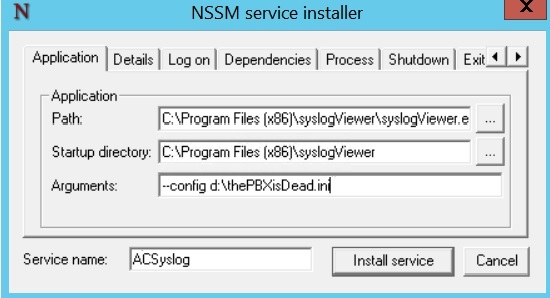 Navigate to the proper .exe file and run "NSSM install". The configuration dialog GUI will popup. Note: Running NSSM without any arguments, will launch a help window. 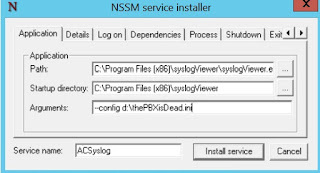 The NSSM install dialog exposes all the options you need to configure a service (ex. run as, startup mode, etc.) but be sure to add the config file argument exactly as you did when you launched the program initially (when we created the INI file). The "Service name" field will be the name you use to interact with this service ( ex. via Powershell), but the "Name" field on the Details tab will be the one that you will see in Services.msc. Be sure to set your "Startup type" to Automatic! Once you install the service, you will see it in the services dialog and you can start it there. 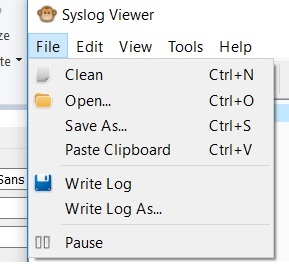 Check your log path and you will see an initial log file created for each device as soon as syslog data starts coming in. The opinions expressed here are my own and do not reflect those of my employer or any other entity. The information provided here is as is , with no warranties whatsoever. Use at your own risk. Copyright 2015 Mitch Steiner. Awesome Inc. theme. Powered by Blogger.